There are heroes, but are there enough ? If you have read many of these posts, you too must feel the urgency. 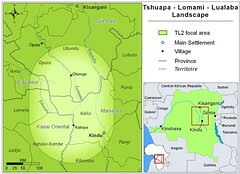 The challenges to Congo’s “wild wealth” are enormous. In the Garamba National Park, Virungas National Park and Kahuzi Biega National Park large areas have been held by rebels who hunt freely for food and profit. In Salonga National Park and Okapi Reserve the poachers have often had the backing of small-time army officers or police. And in the rural out-back there is a massive underclass, not necessarily hungry, but poor. You can eat from your garden, but often it cannot produce the cash you need to buy clothes, get medical treatment, and educate for your children….let alone acquire a tin roof or a motorcycle. What is more, without fail, if the forest near your village still has animals, meat buyers will come and they will bring cartridges for your home- made 12 caliber rifle. 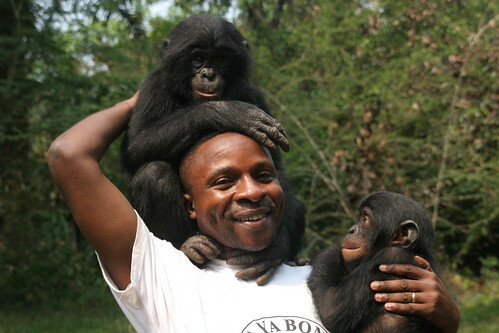 Emmanuel Venty’s courage and humanity have been the success of many anti-poaching missions. The bushmeat market is unregulated: wood-smoked carcasses of protected species and unprotected species lay side by side, undifferentiated, in city markets. The forest is an open commons; if it is not you that shoots the black and white colobus or traps the okapi, it will be your neighbor. A conservation worker who was stoned, threatened with machetes and received death threats, and is still active. These heroes have done great things – their tasks and their sacrifice were enormous. Are they enough? No, Conservation in Congo will continue to need heroes. And since the voting-in of these heroes, more heroes have been made. Alas, may they rest in peace. 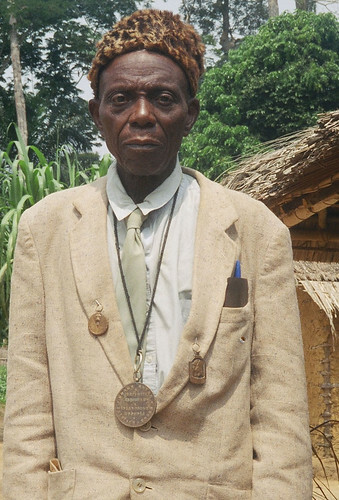 Chief Iyomi de Yongo, whose traditional lands are within a Park, has nevertheless offered invaluable help to conservation. This entry was written by Terese Hart, posted on 2009-02-20 at 7:27 pm, filed under Bushmeat, Links, uncategorized. Bookmark the permalink. Follow any comments here with the RSS feed for this post. Post a comment or leave a trackback: Trackback URL. Very nice article on remarkable persons. Good to know that they will receive and award.